So everyone knows that it's the Blogger's Quilt Festival right now. And I've been thinking about it for a few days. I was sort of bummed out because I don't feel like I have too many large quilts to choose from this year. Which is just silly, because there's this, this, this, this, and the commissioned top I'm quilting right now. And for some reason I felt like I just had to show something that was a throw sized quilt. But when I get down to it, one of my favorite quilts of the year so far was a mini quilt! I love my Llamalicious mini that I made for Jessica in our personal swap, and I love that I made it work with piecing those tiny strips and all those diagonals and all those seams. I really love how the rows that create a chevron shape meet at the seams, but the rows that go the same way are off -- it creates a wonderful sort of energy-wave type look. Laurie Wisbrun's fabric is hilarious and delightful and I'm so glad that I splurged to get some. I can't wait to recreate this exact mini into a pillow for my couch! Plus, the back shows off the leftover strips and the quilting...which reminds me of the Pink Floyd logo! And what's not good about Pink Floyd?!! It was nice to remember that quilts don't have to be big to be an accomplishment and they certainly don't have to be big for you to love them. 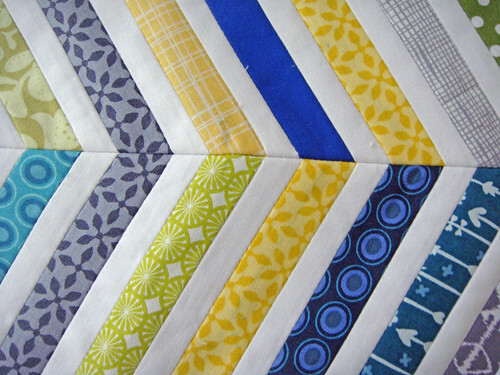 BUT, if you do love big quilts, and you wish this was a pattern for a big quilt, it's coming! [And no, it's not the pattern referenced in my birthday-palooza post]. I've been working diligently behind the scenes to turn my original concept from a mini into a quilt pattern that showcases a fussy-cut focal fabric in the diamond and triangles, with coordinating fabric as the strips. Coming to a computer screen near you soon [hopefully]! Llamas? I'm in. 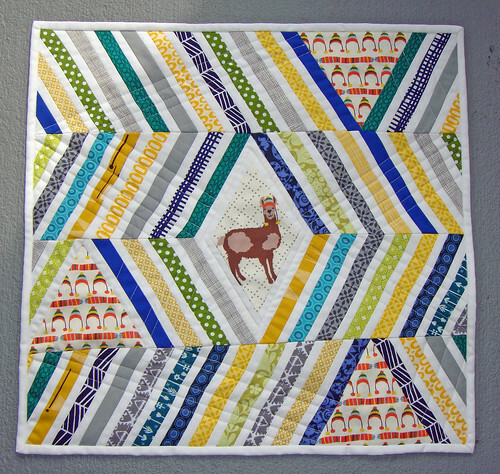 :-) I love this quilt - your use of fabrics and that fussy-cut llama are just great! Adorable! The fussy cut Llama is just fabulous! It's wonderful Rebecca. so cute, and unique! I can see why you love this mini quilt. It's so charming. Llamalicious indeed! I have always thought this mini is just super cute! love the way you have used the llama! 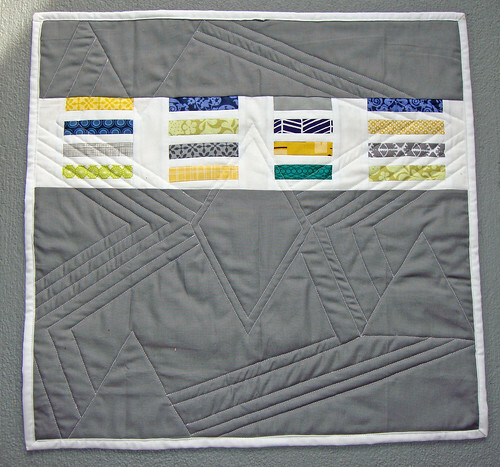 What a fun quilt design to show off the center! Nice work! Mi piace per la perfezione degli incroci! It's adorable! 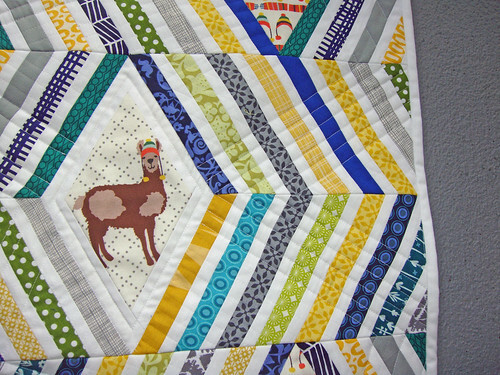 I love chevrons and also quilts with a sense of humor!